As ex-Army Rangers now turned contractors for a PMC, ARMY OF TWO challenges you to fight along side your team-mate on missions developing and using the combined skills necessary to become the deadliest TWO man military outfit. Whether with a live player or ARMY OF TWO's unique partner AI, ARMY OF TWO delivers a revolutionary new way to play an action shooter. On or offline, players can seamlessly transition from AI to a live partner as they fight their way through war, turmoil and a conspiracy so vast it threatens the entire world. When one man is not enough, it's going to take an army of two to save us. Co-op is no longer a mode, it's the game. Players must undertake TWO man missions using TWO man strategies and tactics to ultimately create a TWO man advantage that no enemy can withstand. ARMY OF TWO delivers intelligent partner AI (PAI) that will interact, adapt, collaborate and learn from their human partner. The PAI will also react and adjust to the gamer's ability and how they play the game by taking the lead or following, driving strategy or taking orders. It is the dream of the human machine. Customise and upgrade dozens of deadly weapons and share them with your partner off or online. EA's Montreal game studio is working to deliver realistic character and environmental effects including fluid dynamics that showcase an open-ocean water-wave simulation as well as physics based animations. ARMY OF TWO will captivate gamers with a politically charged storyline, centering on the impact and ethical issues of Private Military Corporations. 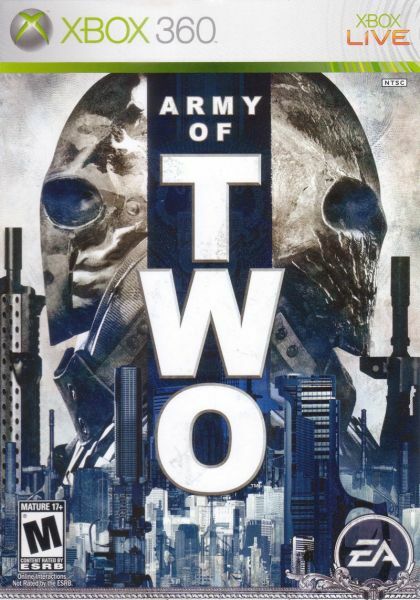 ARMY OF TWO redefines TWO MAN online gameplay with players seamlessly moving from PAI to live players as they make their way through the game.